It’s obvious that a different country will have different laws, but a lot of Americans see Canada as an extension of itself sometimes, when it comes to guns. The idea of hunting in the Canadian frontier is a romantic view that many Americans have, and while it is true that Americans can bring guns to Canada for hunting trips, it is not the case for concealed carry. This reminder is due to two separate incidents in recent weeks in which Texans entered the country with handguns, a shotgun, and loose ammunition in their cars. In each situation, the tourists were also handed $775 USD fines, had their firearms confiscated, and were barred entrance to the country. Now while these situations were the ones mentioned in the report and as the reason for the Canadian government’s reminder, they were hardly the only incidents. From January to June of this year, 413 guns were seized at the border, both from smugglers as well as concealed carriers. The figure is up from 386 guns seized during the same period in 2015, according to government figures. 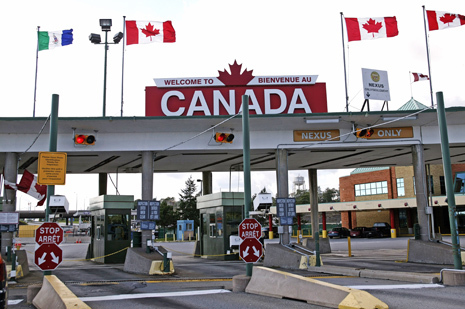 The Canadian government is also worried about its recent rise in violent crime, and is attributing some of the statistics to gun smuggling from the United States. So if you are a concealed carrier, and take a look at a reciprocity map to know whether or not you can take your gun to a specific state, just view our neighbors to the north as one big no carry zone. Canadians are a bunch of pussies. I want a gun. How would one transport a handgun to Alaska if they planned to drive? There is no way to do that legally that I’m aware of. Potentially there is some way to petition via some amount of paperwork in advance of reaching to border… but if that is an option I’ve never been able to find it. I’m told you have to ship it from an FFL to an Alaska FFL. I will not travel to any destination where I cannot take my means of protection . I am 81 years old, cannot fight hand to hand and cannot run. I refuse to be helpless and if I cannot protect myself I will not go!